You may qualify for a government contribution of up to £1300 to provide additional support and educational opportunities for your child. 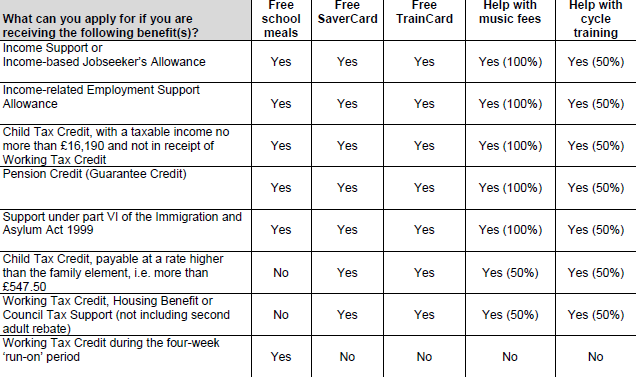 Free School meals are now provided for Reception, Year 1 and Year 2, but as you see the table below goes beyond that. If your family is in receipt of one of these benefits, then please contact the school office to enable us to support you in your application. If the application is not completed before the end of September, then your child misses out on £1,320 funding over the academic year. This would be a great shame, as the funding could pay for: school trips, supported activities within school, chargeable activities within school, occasional breakfast club or after school club attendance. If a member of your family works for the Ministry of Defence (armed services) then you can apply to claim £300 for your child which will be paid direct to the school. Please get in touch as soon as possible if you think that your child should receive Pupil Premium or Services grant. Thank you.